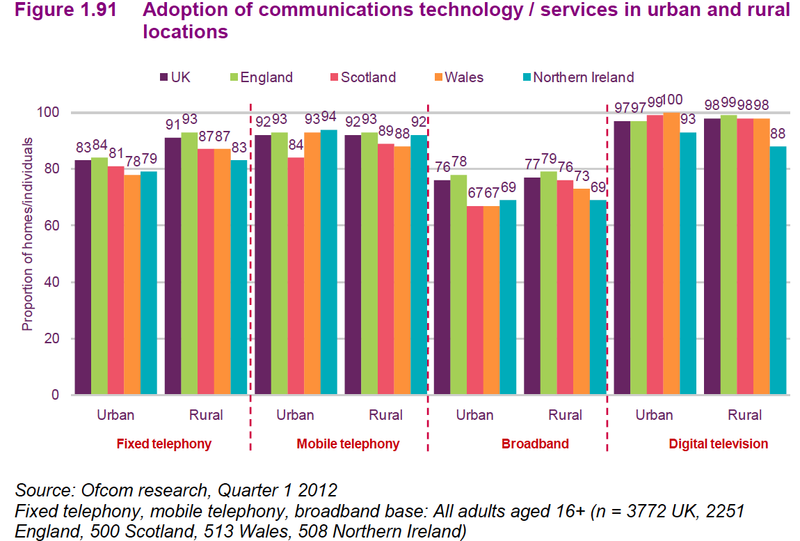 In many ways Northern Ireland has been the UK’s next generation broadband laboratory. The results to date should worry every county council with a rural constituency. After spending more than £56m and 18 months rolling out next generation broadband, Northern Ireland (NI) still has the lowest uptake of users in the UK, and there are on-going service problems in rural areas. Ofcom says rural and urban broadband penetration in NI are both at 69%, the lowest in the UK, despite spending £3.9m on advice to SMEs and 100% broadband connectivity. In its latest communications market report, published in July, the regulator doesn’t split penetration figures for “superfast”, saying only that 6.6% of all UK broadband connections are superfast. Assuming the NI has an average take-up of superfast, that makes the average cost per connected household to date £1,156. NI’s business department, DETI, planned to have a contract in place by December 2009 that would see 85% of NI’s businesses having access to next generation broadband. The 2011 census shows that NI has 1,810,900 people, and 703,300 households. BT won a £48m contract on 3 December 2009 to roll out fixed wire broadband. At the time it said it would spend nearly £30m of its own money to upgrade more than 180 exchanges to provide a 10Mbps download service in urban areas, and 2Mbps in rural areas. “All of the technologies to be used will be fixed line with fibre being the predominant solution. There are few, if any, parts of the British Isles which will have anywhere near the amount of fibre that is going to be deployed in Northern Ireland, particularly in our rural areas,” ministers said then. Ministers then claimed the project was complete on 27 July 2011. BT and Northern Ireland Executive (NIE) press releases show that the project went over budget, despite claims to the contrary (see table below). BT contributed around £32.7m, the NIE £250,000, the NI business department (DETI) £18.3m, and the agriculture department (DARD) £2.5m. This amounts to £76.32 per household, or £29.64 per person. BT has upgraded 167 exchanges and installed 1,265 Infinity-capable street cabinets. Separately, Project Kelvin, completed November 2010 for around £24m and co-financed with European money, gave NI its own fast link to North America and a better connection to Europe via the Hibernia North Transatlantic cable. In May this year, posts to the online BTCare community forum revealed problems with BT’s fibre to the home Infinity service in Co Antrim and Down. “There is a clear trend of full performance in the morning (i.e. downstream speed of 96.7% of your IP Profile + max supported upstream speed) which then deteriorates any time from 9am onwards down to a low of < 1 meg downstream but with full speed upstream. This issue then remains for the rest of the day before returning to full performance after midnight,” said one, and endorsed by another poster. There was no BT response on the message thread. Five months later, the BBC yesterday reported the problems are ongoing, and more widespread, seemingly affecting all NI rural areas. The broadcaster reported that DETI has commissioned a consultation into the issue. “There are more than 5,000 postcodes currently on the list of weak broadband coverage, but the irony is that the survey is taking place online,” it said. Note: The -£1.9m is a balancing figure, mainly for wireless broadband projects. Is the Urban Broadband Fund a dark fibre bribe? Is the government’s £150m Superconnected Cities initiative effectively a bribe to BT to offer a dark fibre product? Ofcom holds the cities are already well-served by the market, so the plan surprised everyone when it was announced. The idea is to make available “up to” 100Mbps connections to businesses and residents of the country’s 20 largest cities. The government has set up the Urban Broadband Fund (UBF) to disburse the money. Culture secretary Maria Miller said this week the first 10 will share £114m, with London, fibre-wise, already the best-served of all UK cities, getting most, £25m. It emerged recently that ministers are considering a proposal from BT to bundle superconnected city procurements with the BDUK’s rural procurement framework. It is conceivable that BT has also asked that public service networks run by local authorities also be lumped in. If ministers accede to the proposal, it could give BT economies of scale that the other 11 approved PSN suppliers already find hard to match. The cities up for funding (see below) are already shot through with fibre, coax, Wi-Fi and increasingly with high speed mobile broadband from 3G and LTE operators. To provide 100Mbps services to business and residential premises they will require multigigabit backhaul networks. Ofcom has just closed its consultation on the £2bn business connectivity market, essentially a review of the leased line market, and will report in 1Q2013. Its opening comments show that Ofcom believes that BT has an effective monopoly for high speed (above 1Gbps) services throughout the UK, except in the Hull area and west, central and east London (WECLA). Demand for speeds above 1Gbps has been growing very quickly, it says. “We believe that circuit volumes have increased more than threefold since 2006/07, and we expect that this rate of growth will continue throughout the coming review period. “We estimate that BT’s share of volumes is 59 per cent. The market appears to be highly concentrated, with BT supplying more than six times the volumes of the second largest provider. Whilst the high growth and high average revenue per customer suggest that the prospects for competitive entry in this market may be favourable, BT derives a strong advantage from the ubiquity of its network. “Most services in this market are delivered with WDM (wavelength division multiplexing) equipment whose technology currently does not support effective interconnection between different networks. Consequently CPs which use their own infrastructure need to do so throughout the entire route of such a service. This limits the extent of effective competition and gives BT a strong advantage,” Ofcom says. In August BDUK published a prior information notice, asking interested parties to say if they are interested in bidding for contracts for both fixed and wireless network contracts, and if they wanted to be the lead contractor, which cities they wanted. According to a spokesman at the department of culture media and sport (DCMS), 17 firms replied. He declined to name them or the cities in which they were interested, saying this was “commercially confidential”. Giving money to cities to build their own networks could make them competitors to commercial operators, including BT. The alternative, hiring the carriers to build and operate urban networks, simply distorts competition and shores up the winners’ profit margins. Indications from the European Commission, which governs the legality of state aid, suggest providing open wholesale access to dark fibre is almost mandatory to validate taxpayer funding for superconnected cities. BDUK’s Sullivan says wholesale access is the main sticking point in state aid negotiations with Brussels with respect to the BDUK framework. BT does not offer a dark fibre product, which makes it hard to see how it could qualify for state aid, if indeed Brussels’ blessing depends on it offering a dark fibre product. Therefore putting the Superconnected Cities procurements under the BDUK framework risks cutting off the very people it is designed to help from the services they need. The main reason for funding the urban upgrade is to reduce the price and improve the availability of high speed broadband available to start-ups, small and medium enterprises. Implicit in this is that they will pay much less than they now pay for leased lines. Currently, an ‘up to’ 100Mbps fibre/coax asymmetric connection from Virgin Media costs around £35 a month; a guaranteed 100Mbps fibre symmetric connection, bursting to 1Gbps, from rural fibre network operator Gigaclear costs some £195 a month. A quotation from the hSO price comparison website for a single 100Mbps link over a 100Mbps circuit in the Thames Valley area came out at £377.83 a month for a three year contract. There is anecdotal evidence that BT’s £2.5bn fibre to the cabinet upgrade, most of which is urban, excludes business lines and leased lines, even if they are served by the same street cabinet. There are also lots of complaints about conditions governing access to BT’s physical infrastructure (PIA) such as ducts and poles. Originally developed in response to rural next generation access needs, these include a ban on leased line services, higher prices for Infinity-enabled ducts, and a 90-day cancellation clause. City Fibre has partnered with Fujitsu for engineering and Macquarie Bank for the money in a £500m initiative to install gigabit-capable symmetrical services in 15 cities, starting with York and Bournemouth. Its aim is to bring infrastructure competition to those cities for public and private sector customers, including those needing to backhaul wireless transmissions. Once complete, he expects to provide access to one million homes and 50,000 businesses. Matthew Hare, CEO of Gigaclear, which is fibreing up rural villages with a fraction of City Fibre’s budget, says he deliberately avoids BT’s physical infrastructure for similar reasons. While welcoming the government’s initiative as likely to boost his bottom line, Marcus Jewell, CEO of Brocade, which makes carrier and enterprise grade switches, says the £150m UBF “isn’t even a drop in the ocean” of money that’s needed to fibre-up cities. Jewell argues that tax breaks would be better at fostering competition, especially in rural areas. Bandwidth in towns is relatively cheap because of competition, but high in rural areas, where BT has a monopoly. “Why not give tax breaks to people that want to level that playing field?” he says. The government needs to expand its sources of information, he adds. It tends to take advice from the biggest players, who have a vested interest in not encouraging competition but in protecting revenue share. Jewell says he’s “pretty sure” BT will end up getting nearly all the Superconnected Cities work. This is partly because the rules help it, and, with rare exceptions, city councils lack the experience, skills and motivation to specify, procure, build and operate their own networks. This raises the question of whether the money in the Urban Broadband Fund is there to compensate BT for lost leased line revenue, should it have to offer dark fibre to win Superconnected Cities contracts. The chancellor’s autumn statement, expected in December, will say which of 27 more chartered cities will share a further £50m. Candidate cities are Aberdeen, Brighton & Hove, Cambridge, Chelmsford, Coventry, Derby, Dundee, Exeter, Gloucester, Kingston upon Hull, Leicester, Londonderry/Derry, Newport, Norwich, Oxford, Perth, Peterborough, Plymouth, Portsmouth, Preston, Salford, Southampton, Stoke-on-Trent, Sunderland, Swansea, Wolverhampton and York. Is this the true cost of Final Third fibre to the home? The true cost of providing fibre-based broadband access in the Final Third is murky and controversial. Market analyst Analysys Mason has produced a new report that looks at the numbers associated with installing fibre to the home (FTTH), widely seen as the “future-proof” solution. It compares the costs of using BT’s Physical Infrastructure Access product (i.e. rental of BT’s ducts and poles), with the DIY option. It finds that over 10 years, the cost of deployment is 78% of the total cost, rental 12% and maintenance 10%. PIA itself is controversial. BT introduced it at Ofcom’s request. The first reference offer drew howls of protest from the industry. A second offer cut prices some 40% to 50%, but introduced some new costs. Analysys Mason quotes Ofcom CEO Ed Richards saying, in 2011, “PIA allows other providers to compete to invest in superfast broadband in areas where VULA is not available. In areas where BT has no commercial plans to invest, PIA will allow other providers to bid for government (BDUK) funding”. Several suppliers invited to bid for NGA business under the BDUK rural procurement framework withdrew because of PIA. They said restrictions on usage (especially the ban on selling leased lines) meant they could not recover costs from as wide a customer pool as BT; this made it impossible to compete on price with BT. Although Analysys Mason’s assumptions and sums are hidden behind a paywall (AM is after all a profit-seeking company), report co-author Richard Linton was kind enough respond to some questions. Do you have a figure for the average cost to run fibre to the home in the Final Third? PIA assumes a data network overlay on a telephone network. How do the costs differ if you build and operate a custom broadband data network for 5, 10, 15, and 20 years compared to using PIA and an overlay? How do they change if 50% of backhaul from a village PoP to an exchange or peering point is on microwave? The two cases considered in the report are PIA plus 100% self-build fibre, and the new fibre network could be used to deliver voice and data services, or just data. Costs are dominated by deployment costs for fibre-cable. The viability of microwave as a substitute for feeder fibre will be heavily dependent on local conditions e.g. how many microwave hops are required, and how much space is available for fibre in incumbent’s ducts. Assume average CPE throughput speeds go from 10Mbps to 10Gbps over 20 years. Would that affect the PIA network more than the custom network? To achieve a guaranteed 10Gbps per premises would probably require an upgrade to point to point fibre, or WDM PON (wave division multiplexed passive optical network). For a point to point solution, extra fibre would to have to be commissioned on the exchange side of the optical splitters. This may be more of a problem for the cases where space is rented from incumbents i.e. where PIA is used, and will depend on the level of congestion in the feeder routes at the time of the intended upgrade. One approach could be for the new entrant to install, where possible, an empty tube (micro-duct) at Day 1, and simply blow fibre into that tube when an upgrade to a point to point solution is required. If (AWG*-based) PON were to be deployed, new AWGs may have to be installed to complement existing splitters, at existing splitter sites. If PIA were used, this would not be a problem for the new entrant, providing they had installed splitters in their own boxes which had sufficient extra space for the new components. *AWG – Arrayed Waveguide Grating, a device, built with silicon planar lightwave circuits (PLC), that allows multiple wavelengths to be combined and separated in a dense wavelength division multiplexing (DWDM) system, says Fibre Optics Info. BT is trying to disguise its true costs to supply next generation broadband to the Final Third by adding overheads, new job types and not reducing costs where these jobs are already accounted for. If BT’s proposals are accepted, local authorities could pay almost twice the actual costs, and BT will not have to match public funds with its own. In addition to direct and planning costs, BT asks for state aid to cover “Availability payments” and bonuses for customer connections. Based on a financial model (see table below) of a 20% take-up from 100,000 homes passed, this would raise the public contribution to BT’s roll-out from £11.4m to £22m. BDUK’s CEO Robert Sullivan declined to be interviewed on the apparent doubling of roll-out costs, saying he was “not allowed to” speak to the press. However, in response to a question from Br0kenTeleph0n3, he told a Westminister e-Forum conference the reference financial model is critical to setting a comparable starting point for all BDUK-funded procurements. Insuring that local authorities received value for money is an important part of BDUK’s value-add, but it is a complex regulatory issue, he said. An internal BDUK discussion paper seen by Br0kenTeleph0n3 shows the DCMS agency preparing to question BT’s financial proposals for its fibre to the cabinet roll-out in the Final Third. The proposals aim to justify BT’s claim for state aid for bringing access to broadband speeds above 2Mbps for download to people living in areas considered commercially unviable under a BDUK procurement framework. The BDUK analysis aims to establish a challenge to the value for money offered by BT’s proposals. The author of the analysis believes that BT wants to establish a price history and methodology that result in a “wholesale price” rather than show its actual costs to deliver next generation broadband access (NGA). Actual cost is a key component for calculating the amount of state aid required. BDUK’s comparison of BT bills for early NGA procurements in Northern Ireland, Rutland and North Yorkshire with current proposals shows that BT has continuously increased its apparent cost by adding new job types and not cutting costs where jobs are already accounted for. The analysis suggests BT is trying to recover all its direct costs for a full roll-out despite assuming only one-fifth of residents will take up the new high speed services. BDUK says of BT’s proposals, “Cost inputs and assumptions on cost recovery for element costs are not revealed. Model outputs are driven by a take-up assumption which is unrelated to the actual assets built or needed. The author believes this is because BT assumes it might have to re-sell this “product” to Fujitsu, the only other supplier accredited to supply networks under the BDUK procurement framework. Following a Cabinet Office assessment that Fujitsu is a “high risk” supplier, it is now unlikely that Fujitsu will win any of the 45-odd contracts at stake. BDUK says BT’s stance is unjustified, even though it is understandable given its obligations to wholesale telecommunications services, its right to recover costs, and even though the framework encourages it. The effect of BT’s proposals is to fix the “standard cost” of adding a house to an NGA service (anything above 2Mbps download speed) at £520 for the physical infrastructure plus £84 to connect, total £604, excluding VAT. By comparison, rural fibre network operator Gigaclear offers a guaranteed 10Mbps symmetrical installation, bursting to 1Gbps, for £100, which includes 20% VAT. Fitting the equipment is on a DIY basis or contractors will do it for £85 for a 50m “drop” between the curb and the premises. Community-funded B4RN, which is building a 1Gbps fibre to the home (FTTH) network from scratch in the most broadband-unfriendly part of Lancashire, reckons its average cost per connected house will be less than £1,400. A Cabinet Office decision to rank “Fujitsu” as “high risk” has effectively reduced the number of companies eligible to bid for more than £1bn of BDUK-funded next generation access projects to one – BT. Internal government documents seen by Br0kenTeleph0n3 suggest that the government will consider Fujitsu Telecom as “high risk” and that any bids from such companies will be “scrutinised particularly carefully” before being given more work. Local authorities responsible for rolling out new broadband as well as public service networks in their patches are likely to prefer the low risk option. Yesterday news broke that BT had won NGA bids in Cumbria, Norfolk and Surrey. Twitter conversations suggested no-one is prepared to bet against BT making a clean sweep of BDUK contracts. Although Fujitsu’s troubles are believed to be related to a failed project at the NHS, the blacklisting completes the humiliating BDUK framework procurement process for which it paid almost £3m to consultants at KPMG and Pinsent Mason. After starting with nine invited candidates, BDUK ended up with just BT and Fujitsu signing up. In practical terms, only BT is left, despite Fujitsu claiming it’s business as usual. That’s not all. The European Commission’s DG Competition has still not approved BDUK’s procurement framework as a vehicle for distributing state aid. BDUK CEO Robert Sullivan told a Westminster e-Forum conference this week that he was confident approval would come in autumn. There is no indication yet how Fujitsu’s blacklisting might affect BDUK’s negotiations with Brussels. The sticking point, Sullivan said earlier, is wholesale access to the new networks. European Digital Agenda chief Neelie Kroes wants regulators to force incumbents to offer dark fibre to increase competitive access to physical infrastructure. BT has said it won’t offer dark fibre. If DG Competition hangs tough because of BT’s imminent monopoly on BDUK’s money, BT may have to concede on dark fibre. Or BT might just tell the government it’ll stick to the two-thirds of the UK’s commercially viable communities. That could destroy any chance of the government meeting its goal to have the best and fastest broadband network in Europe by 2015. But through Ofcom it could also make BT provide dark fibre and a standard interface such as Ofcom’s Active Line Access, and spend the BDUK money with network operators who are prepared to work in rural areas. What broadband gap is the government funding? 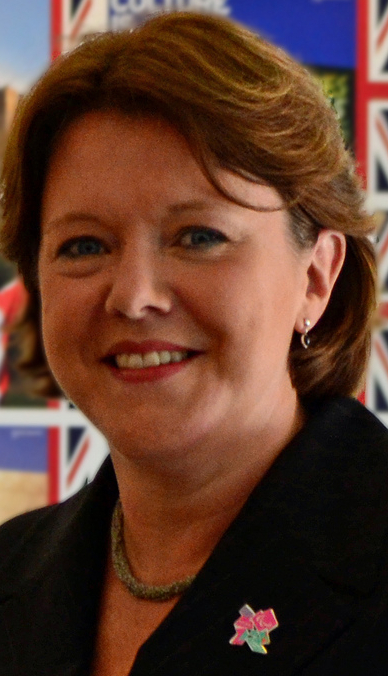 Last week’s statement by new culture secretary Maria Miller, about cuts of red tape to speed up new broadband roll-outs, actually announced a return to the status quo even before the BDUK process began. Most UK citizens are not going to get even a pedestrian “superfast” broadband despite the government spending more than £1bn* in taxpayers’ money to get the fastest broadband service in Europe by 2015. Acknowledging that “Superfast broadband is vital to secure our country’s future – to kick start economic growth and create jobs”, the statement went on to say, “superfast broadband means potential headline download access speeds (are) greater than 24Mbps”. In Europe the target is 30Mpbs for all, with half the population subscribed to a 100Mbps service by 2020. This statement also ignores BT’s much ballyhooed announcement that it had doubled the network frequency, bumping download speeds “up to” 80Mbps and higher. Leave aside the weasel words “potential” and “headline” and consider this: “Our investment will help provide 90% of homes and businesses with access to superfast broadband and for everyone in the UK to have access to at least 2Mbps.” What percentage of the population will receive a speed between 2 and 24Mbps? In addition Br0kenTeleph0n3 has received reports that even 24Mbps is the top end of what BT’s Infinity fibre to the cabinet service will deliver. It appears that some councils are being told to plan for the average speed delivered from an Infinity cabinet to be just 15Mbps. Users who live close to the cabinet and have good quality copper will enjoy the top speed, but most will not. The imminent arrival of LTE, the 4G high speed mobile broadband technology, is unlikely to help either. Theoretically capable of 300Mbps download speeds, experience in commercial LTE markets suggests that 15Mbps is the norm once a number of users are online at the same time. In fact for its LTE service Verizon in the US advertises 5-12Mbps downloads, and half that for uploads . The government’s desire to have the best i.e. fastest broadband network in Europe by 2015 looks increasingly out of reach, and consumer research by Thinkbroadband shows that nine of 10 people don’t believe BDUK can deliver it. BDUK’s host, the department of culture, media and sport, has not yet responded to questions about the looming broadband gap. * Note. This excludes billion in funding from suppliers, local councils, and European Commission sources.